I am so pleased to have been invited to write this foreword for the book that marks the 10th Anniversary of the GKI Perth congregation of the Uniting Church in Australia (UCA), Synod of Western Australia. This marks ten years of wonderful ministry by the only UCA Indonesian speaking congregation here in Western Australia and we all look forward to the many further blessings that I know God will shower upon this ministry in the years ahead. At a personal level, my earliest experience of the ministry of GKI Perth was through the wonderful singing of its choir at the Easter Sunday Dawn Services in Kings Park, in the days when I was a minister with the Uniting Church in the City. 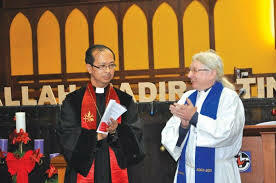 However, since being installed as Moderator in 2008, I have had many more, very special opportunities to share in worship and other special events of GKI Perth, and twice I have been able to visit Indonesia as the guest of GKI Regional Synod of West Java. Our two Synods have been in a special relationship since 2002, through the Memorandum of Understanding (MOU) that came in to being because of GKI Perth and was renewed in Bandung last year. The MOU recognizes how much GKI and UCA share in common as similar churches, both members of the One Holy, Catholic and Apostolic Church. It also pledges each of our churches to stand alongside each other in all circumstances and to strengthen each others’ theological and faith resources for the shared mission. In particular, the UCA Synod of Western Australia greatly appreciates the support of GKI Regional Synod of West Java in supporting the development of GKI Perth. In 1985 the UCA declared itself to be a multicultural church. Now, throughout Australia on any given Sunday, the UCA worships in more than forty languages. In Western Australia in particular, we worship in seven languages, namely, the indigenous Nyungar tongue, Bahasa Indonesia, Tongan, Korean, Arabic, Afrikaans and, of course, English. In addition to this, there are a great many more nationalities and cultures represented amongst our English speaking congregations. This reflects the culturally diverse nature of contemporary Australia and as a nation and as a church we are greatly enriched by it. In this regard, GKI Perth sets a fine example, engaging strongly with the wider UCA and offering strong and enthusiastic leadership in its multicultural ministry. The special relationship between GKI Regional Synod of West Java and UCA Synod of Western Australia is growing not only in a multicultural context but also in a regional context. From the time of its inauguration in 1977, the UCA has recognized that its place is in the Asia Pacific region. For Western Australia especially, that regional relationship is more closely linked with Indonesia than with any other nation. I love pointing out to people that Perth is closer to Jakarta than it is to Sydney. As Moderator of UCA Synod of Western Australia, I have ministers and members who are closer to Jakarta than they are to Perth. Perth is in a closer time zone to Jakarta than it is to any of the capital cities elsewhere in Australia. And reverting to personal experience once more, I am impressed by the fact that I have had more contact with my dear friend and colleague, Pdt. Kuntadi Sumadikarya, Moderator of GKI Regional Synod of West Java, than I have had with my colleagues elsewhere in Australia, and that is saying something! At one level, I think our two Synods set a good example of how two countries that are such close neighbours should relate with each other. At another level, we do exactly what the MOU says we will do: we stand alongside each other, deepening our fellowship in Christ, and strengthening each others’ theological and faith resources for the shared mission. Together we work to serve God’s reconciling purpose for the whole world, a world in which we see all people as children of God, regardless of nationality. These are very considerable blessings that flow as a result of those who founded GKI Perth seeking a place for it as a congregation of the Uniting Church in Australia. The whole Church is profoundly enriched by this history, and by the life of worship, witness and service of GKI Perth. I look forward in fond anticipation for what God will do through its ongoing development in the years ahead.